A Russian Soyuz spacecraft carrying one of the world's most experienced space fliers, a rookie cosmonaut and a NASA shuttle veteran blasted off from the Baikonur Cosmodrome in Kazakhstan late Monday U.S. time, climbing away through a cloudless blue sky to kick off a two-day voyage to the International Space Station. If all goes well, the ferry flight will boost the lab's crew back to six just in time for the long-awaited launch of a commercial cargo ship Saturday, the first of a new breed of private-sector spacecraft needed to keep the station supplied in the wake of the space shuttle's retirement. The Russian Soyuz TMA-04M spacecraft rumbled to life on time at 11:01:23 p.m EDT (GMT-4; 09:01:23 a.m. local time Tuesday), roughly the moment Earth's rotation carried the Site 1 launch pad into the plane of the space station's orbit. "Everything's OK on board, we feel good," commander Gennady Padalka radioed as the rocket arced away to the East. Padalka, who logged 586 days in orbit during a long-duration flight aboard the Russian Mir lab complex and two aboard the International Space Station, monitored the automated ascent from the central seat of the Soyuz TMA-04M's cramped command module. He was flanked on the left by Russian flight engineer Sergei Revin, a space rookie acting as co-pilot, and on the right by NASA educator-astronaut Joseph Acaba, veteran of a 2009 flight aboard the shuttle Discovery. Acaba said before launch that he was looking forward to his first ride aboard a Soyuz spacecraft, adding that he was confident the Russian launcher would provide a safe ride following a string of recent problems with other Russian launchers and spacecraft. "We should never fool ourselves that going into space is an easy thing and that it's without risk," he said in an interview. 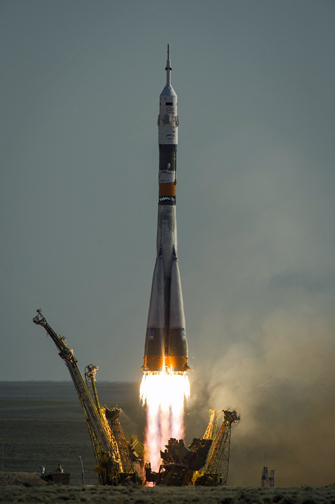 "(But) the Soyuz has been one of the most reliable vehicles we've had to take us into space. So I feel really good about riding on one, I feel comfortable with the analysis that was done. ... And I'm also very fortunate to fly with one of the most experienced cosmonauts on the planet. (Padalka is) very well trained and if we do experience any kind of problem, I feel confident as a crew that we'll be able to get back safely." As he expected, the eight-minute 45-second climb to space went smoothly and Acaba and his crewmates appeared relaxed and in good spirits in live television shots from inside the cramped command module. Moments after separation from the Soyuz rocket's upper stage, the capsule's solar panels and antennas unfolded and Russian flight controllers said the vehicle was in good shape as it set off after the space station. "Congratulations on the successful launch," a Russian flight controller radioed. "Thank you very much," Padalka replied. "Everything looks OK here on the ground, telemetry looks good. The ascent was nominal, so enjoy your work. We'll wish you best of luck." The flight plan calls for the Soyuz to rendezvous with the International Space Station early Thursday -- Acaba's 45th birthday -- maneuvering to an automated docking at the lab's upper Poisk module around 12:38 a.m. to kick off a four-month stay. Standing by to welcome the crew aboard the station will be Expedition 31 commander Oleg Kononenko, European Space Agency astronaut Andre Kuipers and NASA flight engineer Donald Pettit, who were launched to the lab last Dec. 21. "The on-orbit vehicle is in excellent condition," Kirk Shireman, deputy manager of the space station program, told Padalka, Revin and Acaba during final preparations for flight. "I know your crewmates in space are anxiously awaiting your arrival. It will be a busy time for you. Here in just a few days after your launch will be the launch of the first commercial space vehicle from the United States. "In addition, of course, you'll have a (Russian) Progress vehicle (arriving), a Japanese HTV (cargo ship) and many activities associated with those vehicles coming and going. And finally, I know you'll have a busy scientific mission. There are over 215 investigations affecting over 400 scientists here on the ground and so lots of important research for you to conduct. I wish you the best of luck and despite your busy schedule, I hope you have some time to enjoy the wonderful view." Right off the bat for the new crew members will be the launch of an unmanned Dragon cargo ship built by Space Exploration Technologies, or SpaceX. This will be the second test flight of a Falcon 9/Dragon spacecraft but the first to go all the way to the space station. Launch from complex 40 at the Cape Canaveral Air Force Station is targeted for 4:55 a.m. Saturday. After exhaustive tests to make sure the Dragon is operating properly, the spacecraft will maneuver to within about 30 feet of the space station on May 22 and await capture by the lab's robot arm. If all goes well, the Canadian-built space crane, operated by Pettit and Kuipers, will pull the Dragon capsule in for berthing at the Earth-facing port of the forward Harmony module. "As it's approaching, we'll get the robotic arm and get it in a location that this vehicle's going to approach," Acaba said. "Then at one point, we'll send a command where the vehicle goes into free drift where there are no engines firing. Then we ... take the robotic arm and grapple this little pin that's attached (to the Dragon capsule) and once we grab it, we take it and actually attach it to the space station. "So it's a fairly dicey operation, there's a lot of room for things to go wrong and you really want to make sure you grab it. ... We're hoping for the best on all that, but we train for situations that are far worse than we ever expect. So I think we're ready for most things that might happen to us." Hatches will be opened the day after berthing and the crew will begin unloading about 1,150 pounds of food, clothing and other low-priority items. The capsule then will be repacked with around 1,455 pounds of trash and no-longer-needed components and detached from the space station on May 31. From that point, SpaceX plans to guide the craft back to Earth for a parachute descent to a Pacific Ocean splashdown. The Dragon launch originally was scheduled for early February, but the flight has been repeatedly delayed to give engineers more time to test the complex flight software that will guide the spacecraft through its rendezvous with the station. "We closed out a lot of work over the last couple of weeks; there was a lot of software that's been rechecked and validated by the space station program," said Mike Horkachuck, a senior NASA manager working with SpaceX. "They did an end-to-end test of the data system as well as another stage test, checking all the software functionality as it relates to space station, looked at a lot of the changes that have been done on the software and gotten comfortable that all those changes were acceptable." Acaba said he considered it an honor to be on board the station for the first commercial cargo mission. "It is a very complicated launch demonstration and then the crew has to actually go and grapple the vehicle and attach it to the space station," he said. "None of that is easy. We realize that, so we wish them all the best this week." If the test flight goes well, SpaceX hopes to begin routine cargo delivery missions in August. 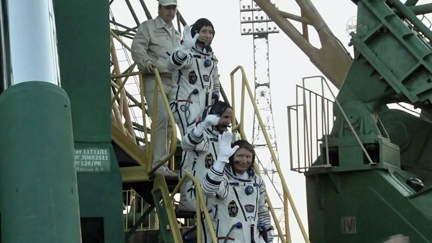 Kononenko, Kuipers and Pettit are scheduled to return to Earth on July 1 aboard their Soyuz TMA-03M spacecraft. At that point, Padalka, Revin and Acaba will make up the core members of the Expedition 32 crew with Padalka serving as commander. Three fresh crew members -- cosmonaut Yuri Malenchenko, NASA astronaut Sunita Williams and Japanese astronaut Akihiko Hoshide -- will join the ISS-32 crew two days after launch July 15 aboard the Soyuz TMA-05M spacecraft.